An isolated private castle in the Blue Ridge Mountains, Greystone sits above Lake Toxaway and welcomes families with gracious service and outdoor recreation. How many family-friendly, luxury properties offer lakefront scenery, water sports, elegant cuisine, world class tennis, golf and spa treatments – yet only an intimate 33 guest rooms? Not many, I suspect. But The Greystone Inn tucked into North Carolina’s Blue Ridge Mountains is one of them, or, perhaps, the only one. 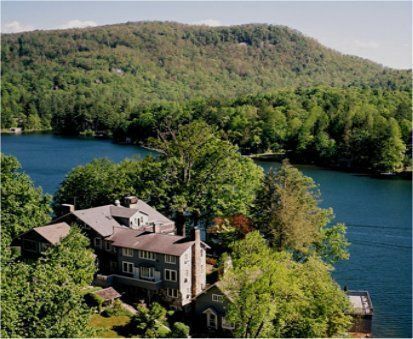 Located some 50 miles southwest of Asheville, The Greystone Inn sits perched above the north shores of the lovely Lake Toxaway, whose 14 miles of shoreline are bordered by dazzling views right out of “On Golden Pond” (although that was New Hampshire). 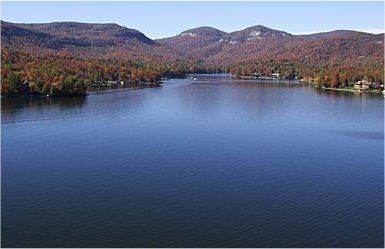 The largest private lake in North Carolina, its 640 acres dominate the resort and continually drew my husband and me to its shores. We swam in it, boated on it, sat on its edge, bathed in its reflected sun and simply stared at it. As guests, we had free reign of kayaks and canoes, plus paid access to the resort’s pontoon boat for leisurely excursions, and power boats for decidedly un-leisurely tubing, knee-boarding or water skiing, complete with squealing kids and laughing parents. There also are bass boats to rent for finding trout, walleye and… bass. Among this plethora of floating vessels, we preferred the very civilized late-afternoon champagne cruise aboard the mahogany launch Miss Lucy, named after the original owner. Our “Rockefeller Room,” with wood burning fireplace, aged hardwood floors and comfy king bed, didn’t overlook the Lake like some others in the mansion. The 12 more modern rooms of the “Hillmont” addition just across the small parking lot are a bit more spacious (particularly rooms on the top floor), with wet bars, small fridges and private porches. These and the two larger Lakeside Suites overlook the water and may better suit families with younger children, although they lack the historic B&B vibe of the mansion. But who spends time in the room at such a place? The many activities and boating options surprised us (in a good way) in terms of quality and ambience. 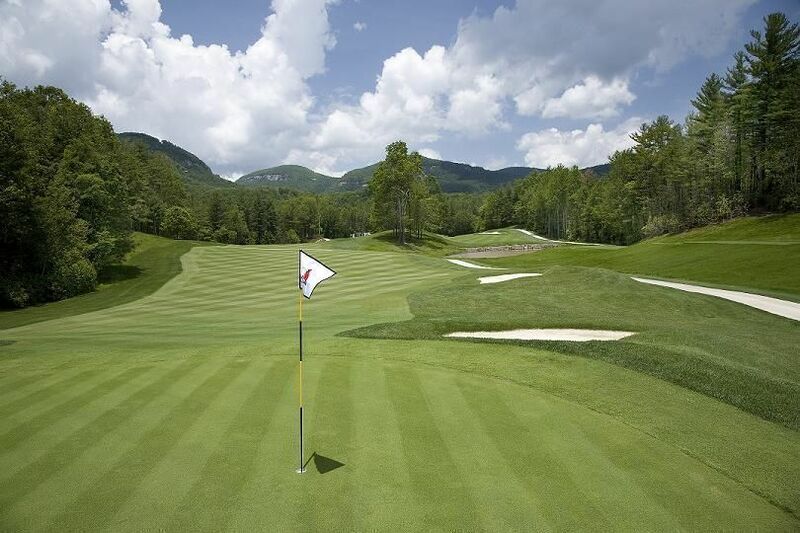 In addition to water sports, Greystone guests have full privileges at the adjacent Lake Toxaway Country Club, with its small, but up-to-date fitness center, Tom Fazio golf learning center/driving range, and stunningly redesigned Kris Spence golf course, winding 6,600 yards through dazzling mountain terrain. It’s worth the cart ride alone. There also are five clay courts and one hard court for the tennis nut, as well as a handsome professional croquet lawn, complete with staff to teach croquet rules and etiquette for the uninitiated. If lake swimming is not your thing, a small, rather ordinary pool is a decent place to splash with the kids. Staff informed us of mountain biking and nature hiking and area waterfalls, but we found it difficult to venture from the pull of the lake. We settled easily into the rhythm of Greystone, active during the day and then quietly enjoying afternoon tea in the parlor, a late afternoon cruise, followed by a glass of wine and complimentary hors d’eouvres as evening set in. After all that, we chose to eat dinner late in the charming Lakeside Dining Room and Terrace, where guests take their eating seriously. The elaborate five courses are made known each morning at the mansion’s front desk (a deliberate attempt to make us work out). Dinner is a decidedly dressy affair but not stuffy. We both were quite impressed with most everything, from the lump crab cake with lemon aioli to the buttermilk pie with brown sugar sauce. Breakfast on the terrace during a cool summer morning is a treat, surrounded by hardwoods and lush garden views above the lake. The wide array of fruit, fresh squeezed juice, fabulous eggs benedict and other hearty choices provide the fuel for our daily activities. If you find yourself hungry come lunch time, the Lake Toxaway Country Club dining room is the only place on site for Greystone guests (the one meal not included in your room rate). 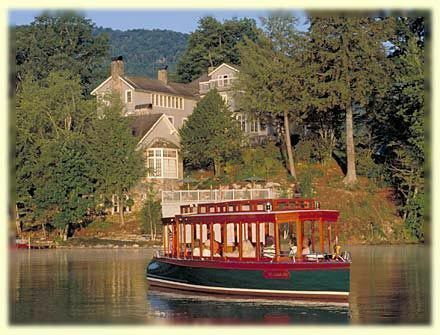 Our last evening, as we quietly cruised on the Miss Lucy past lakefront mansions, taking in the history of the lake and inn while sipping champagne and sparkling cider, we chatted with fellow guests who turned out to be multi-generations celebrating a golden anniversary. We realized then that there’s something for any generation at Greystone, whether foodie, active, quiescent, sporty, outdoorsy, you name it. Families would do well to follow the Edisons, Fords and Rockefellers up the mountains behind Miss Lucy. 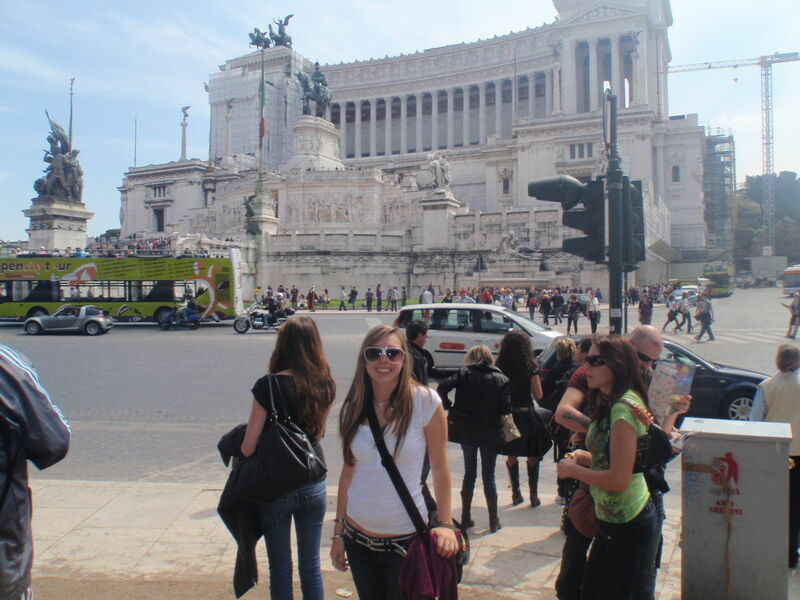 Ask about frequent special offers (such as free golf or substantial room discounts) when reserving. Be sure to get driving directions from the resort or risk a Mapquest disaster. Prev Article Prev Article Trip to Nice, France.